Oh, lamentations! 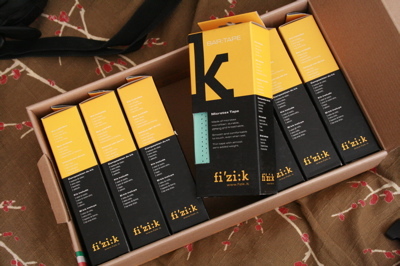 Fizik, the purveyor of microfibre handlebar wrap, have discontinued wrap in celeste, the sea-foam green hue made famous by Bianchi bicycles. Currently, 4 out of my 6 bicycles are celeste or have celeste accents… even my custom Sycip is celeste. Half of them have matching celeste Fizik Arione saddles too. Until this year, I was just going to always keep a spare celeste Fizik bar wrap in supply box at home. My life was going to be so easy! I mean, I’m not too crazy. I don’t have to have spanking new wrap on my bars; the bars can have can dirty or ripped wrap and still pass my requirements. 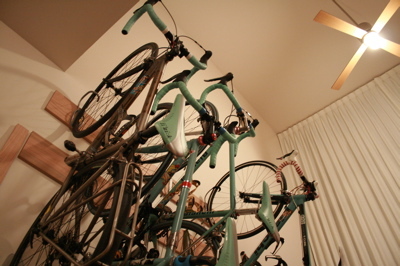 But something fills my heart with glee to see my arsenal of bikes on the wall… celeste with celeste saddles. So I’ve done what any rational person would do: I’ve bought up all the remaining stock of celeste Fizik wrap that I could lay my hands on. A couple years ago, I stocked up on Rudy Project Tayo glasses after they had already been out of production for 3 years, because nothing else fits me as well. Byron tried to buy a pair off of me. I told him no way. Ten years from now, I’m going to be like that one guy who rides around wearing original Oakley Factory Pilot shades.